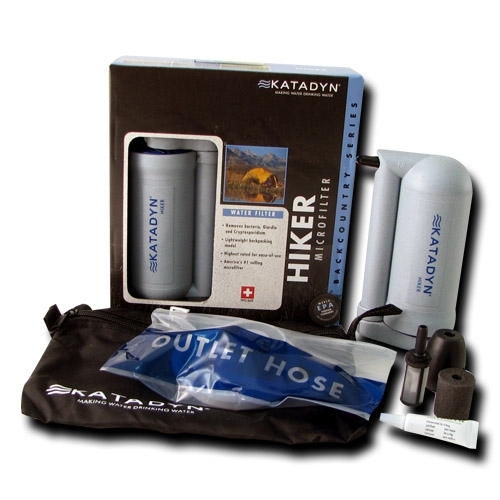 KATADYN - HIKER MICROFILTER UNIT The Katadyn Hiker is the best selling micro-filter in the US Outdoor Market. Lightweight and easy to use design is the best choice for all around use. Unique, pleated cartridge design provides fast and easy pumping. Convenient and handy for 1�2 people (e.g. while hiking or trekking). Compatible with hydration bladders. Includes: Pre-filter, bottle adapter and carry bag Capacity (gal) ~ 200 Output (gal) ~ 1 quart/min Technology ~ Anti Clog Technology with 0.3 micron glass-fiber (no cleaning needed) Activated carbon granulate.